Letters From A Tapehead: Conrad Schnitzler & Schneider TM: "Doozer"
Conrad Schnitzler & Schneider TM: "Doozer"
If reading or hearing the name Conrad Schnitzler garners sudden and inescapable interest, it's likely that you'll want to check out the Con-Struct series. Schnitzler was a founding member of Kluster, (before they were renamed Cluster), co-owner of the Zodiak Free Arts Lab, (which was a haven for the artistic and experimentally minded people of Berlin in the late 60s), and an early member of Tangerine Dream. The man was directly responsible for the facilitation of a very prolific and creatively rich period of musical exploration, a period that he himself contributed to in various functions as either collaborator or composer. With all that said, the Con-Struct series was conceived by Jens Strüver, half of the electronic group, Borngräber & Strüver. After gaining access to an extensive sound archive that Schnitzler had built, Strüver proposed that new music be developed utilizing this archive and that musicians of a similar ilk helm each installment in the series. For this new release, Schneider TM was handed the keys. You can check out the track "Doozer" below. You can also sample album snippets from the Schneider TM release. These were provided by Bureau-B. Information on the release was provided by Sean Newsham at mutante-inc.
Conrad Schnitzler (1937–2011), composer and concept artist, is one of the most important representatives of Germany’s electronic music avant-garde. A student of Joseph Beuys, he founded Berlin’s legendary Zodiak Free Arts Lab, a subculture club, in 1967/68, was a member of Tangerine Dream (together with Klaus Schulze and Edgar Froese) and Kluster (with Dieter Moebius and Hans-Joachim Roedelius) and also released countless solo albums. Schneider TM has been involved in various musical fields since the late 1980s. Between 1989 and 1997 he played and sang in indie/noise rock and pop bands like Locust Fudge and Hip Young Things, before focussing more on electronic music from 1997 onwards, starting up his project Schneider TM. In 1999 Dresselhaus formed the duo Angel together with Ilpo Väisänen. What is the concept of the Con-Struct series? Conrad Schnitzler liked to embark on daily excursions through the sonic diversity of his synthesizers. Finding exceptional sounds with great regularity, he preserved them for use in combination with each other in subsequent live performances. He thus amassed a vast sound archive of his discoveries over time. When Jens Strüver, the producer of the Con-Struct series, was granted access to this audio library at the outset of the 2010 decade, he came up with the idea of con-structing new compositions, not remixes, from the archived material. On completion of the first Con-Struct album, he decided to develop the concept into a series, with different electronic musicians invited into Schnitzler’s unique world of sound. A few words from Schneider TM on his con-structions? 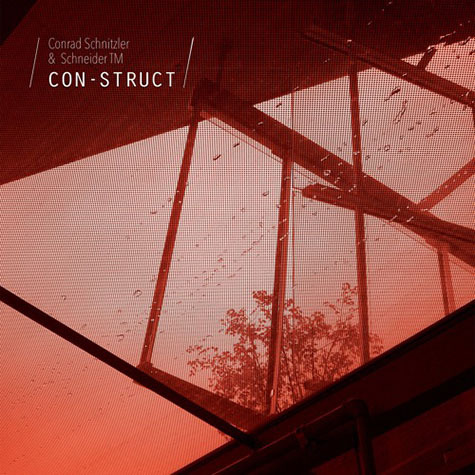 I am very happy and honored to be invited to do an album for the Con-Struct series and wanted to do something special and genuine in this posthumous collaboration with Conrad Schnitzler. I wanted to get as close to his spirit as possible, so I created a musical situation as if we were actually collaborating together in the same room, with Conrad playing his pre-recorded sound-files or modular system and me dubbing and processing it live on the fly… almost as if it was a live-concert situation. Next to many other aspects of Schnitzler’s vast oeuvre, I am fond of the noisy, polyharmonic, polyrhythmic and sometimes quite humorous minimalism of his music, as well as his way of using chance, which often leads to magical and raw beauty. There are no other sounds on this record except for ones created by Schnitzler, sent through my system and processed live. During the sessions I had the feeling of being in a conversation with him. And when I met his widow, Gisela Schnitzler, she told me that they still talk every evening, more than five years after his death, and that he’s still around for sure. So, Conrad, thanks a lot for this experience!